President Yoweri Museveni’s relentless offensive against his party’s secretary-general and erstwhile soul mate Amama Mbabazi was temporarily stopped in its tracks this week after Jacqueline Mbabazi, chairperson of the NRM Women’s League, raised fundamental questions about the basis for the witch-hunt against her husband. Mr Mbabazi, who was sacked as prime minister by President Museveni a month ago, has been the subject of much speculation as he has remained silent about his plans amid accusations that he was running a clandestine campaign to oppose the head of state in the 2016 elections. 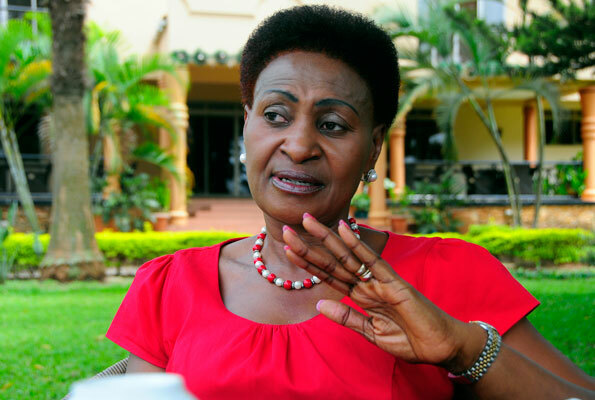 Mrs Mbabazi’s protest came during a meeting of the National Resistance Movement’s Central Executive Committee (CEC) that sat on Thursday night but was subsequently adjourned to Saturday. The meeting had been called to discuss fissures and indiscipline in the ruling party’s ranks as well as to pass a resolution to field President Museveni as the sole candidate in the NRM primaries for the presidential contest in 2016. It was also supposed to find a solution to an impasse over the party register, which is in Mr Mbabazi’s custody, and which he has allegedly refused to surrender. While it has been proposed that a new register be compiled, this option faces legal hurdles as the validity of such a replacement can easily be challenged in court. The meeting was expected to galvanise efforts to dislodge Mr Mbabazi from the influential SG position, a move considered necessary to prevent him from accessing the NRM’s grassroots structures. Most delegates at the meeting declined to comment on the goings-on citing an undertaking to keep the proceedings of the meeting confidential until the party released an official statement. However, sources who sought anonymity said the meeting was brought to a near-standstill when a fiery Mrs Mbabazi took to the floor to question the fairness of singling out her husband for disciplinary action while his alleged infractions were no different from what President Museveni has been doing since February. “Mrs Mbabazi reasoned that there was nothing on record to show that the SG had declared his candidature against Museveni or that he was conducting a campaign,” a delegate narrated Mrs Mbabazi’s argument. Mrs Mbabazi then played her trump card when she argued that if meeting party supporters as President Museveni has been doing and declaring presidential ambitions was a violation of party rules, then the president and the movers of his single candidature resolution at the party retreat in Kyankwanzi last February were equally guilty and should be subject to the same disciplinary proceedings. It was at this point that the meeting was adjourned to allow more time for digestion of the issues raised. The meeting was preceded by choreographed denunciations of Mr Mbabazi, with various constituencies calling for his removal from the SG position, an office whose significance President Museveni has recently moved to dilute by assigning some of its functions to youthful aides. It was reported this week that the NRM Youth League had sent a petition to party chairman President Museveni asking him to sack Mr Mbabazi from the SG position allegedly because he had failed to organise the party and attract new members. In Luwero, 60 kilometres north of Kampala, district chairman Abdul Nadduli was reported to have ordered a church not to host Mr Mbabazi, who had been invited to preside over a function there. While these actions have caused some degree of realignment within the NRM’s support base, according to commentators within the party, a major obstacle for President Museveni is that only a national conference can dislodge Mr Mbabazi from the SG position.